Our new radiator is designed and built to precise dimensional specifications to ensure an exact fit. Each radiator has a stamped brass tank, undergoes a rigorous quality inspection, and is 100% leak tested. This radiator has 10 fins per inch and 4 rows of tubes. It is 27.125″ tall and the core size is 25″ wide. 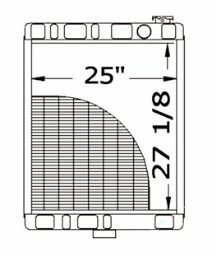 This radiator fits multiple Case-IH Tractor models.